The Lansky 8″ Ceramic Sharp Stick has been receiving rave reviews across the board. 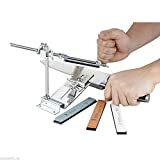 It has been cited as a very easy to use manual hone sharpener, with great performance considering the price. There’s not much to say when it comes to describing the tool. The Lansky 8” Ceramic is obviously that, a ceramic sharpener. The rod is a medium grit ceramic meaning it is able to refine edges very quickly indeed. Jus a couple of strokes is all it takes to sharpen your knives. For easy grip, the Lansky features a durable, non slip wood grip handle. 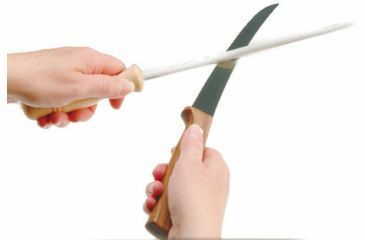 The marketing team at Lansky have come up with the following as part of their sales pitch: “The Lansky 8” Ceramic Sharp Stick is a classic style butcher’s sharpener. The tool is further described as a “space-age 8” alumina ceramic sharpening rod.” Which all sounds rather fancy if you ask me. This knife sharpener should last you years as well. It will take the best part of forever, for the ceramic rod to wear beyond use, and for easily maintenance and cleaning, the Lansky Eraser Block is all you need. As we have said, the Lansky Ceramic sharp has obtained some very positive reviews around the web, with many people citing reliable performance at such low costs being a major factor as to why they are happy with their purchase. Having said that, no product can please all the people all the time. Some negative comments do exist. Some have found the Lansky 8” slightly awkward to use. With a low price point combined with a high performing ceramic abrasive, the Lansky has won itself a lot of fans. If you do not want to fork out the extra for an electric sharpener, and feel confident that the manual route is for you, it seems you could do a lot worse than this. 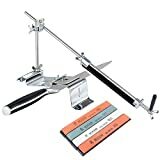 Quick, easy, and economical this is a highly recommended sharpening stick.